PICA is a compulsive eating disorder that affects around 25%- 30% of young children, ages 1 to 2 and sometimes pregnant women. It is the act of eating non-food items. Dirt, clay, and flaking paint.Less common items include glue, hair, cigarette ashes, and faeces. It is most common in children and adults with intellectual and developmental disabilities, such as autism. On rare occasions, pregnant women crave strange, non-food items. 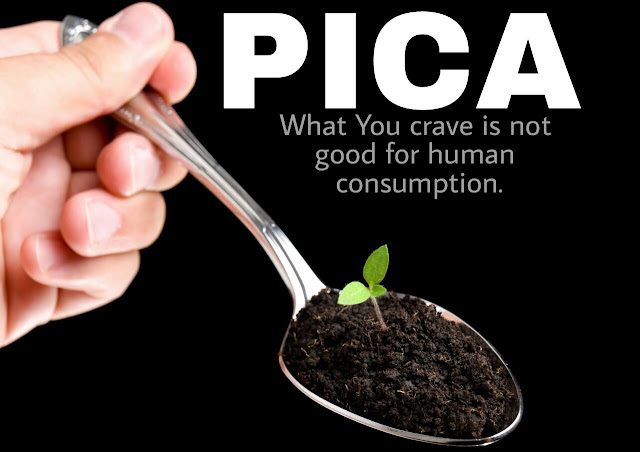 For these women, pica often involves eating dirt and may be related to an iron and zinc deficiency. Treatment will address several areas. ✔infection, or any combination of illnesses. ✔If your doctor finds your child doesn’t have enough iron or zinc, he or she will address that with a vitamin supplement and dietary recommendations. It is necessary to provide nutritious diet to the children and pregnant women not just to prevent PICA but for the overall health benefits.